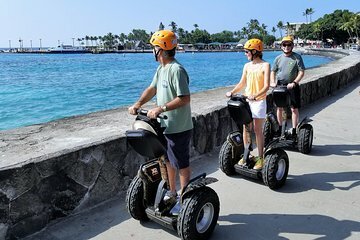 Dek meer grond dan mogelijk te voet en ga naar plaatsen die niet toegankelijk zijn voor tourbussen tijdens deze begeleide Segway-tour door Kona. Leer meer over de geschiedenis van Old Kona Town terwijl je moeiteloos door de straten glijdt. Bekijk bezienswaardigheden zoals het Hulihe'e-paleis, de Moku'aikaua-kerk, Kamakahonu, White Sands Beach en Ku'emanu Heiau, die gewijd was aan de surfsport, omdat uw gids elk een historische context biedt. Everytime we vacation in a new city, we try to schedule a Segway tour on the first day. This gives us a quick close-up overview of the areas that we'll be walking around and local sights that we might notice from a car. This Segway tour of Kona was great! The owner and our tour guide were both very friendly and informative about the area around Kona and places to see. This was our first time riding Segways with the big off-road tires ... the extra cushioning made the 2 hour tour very easy on your legs and feet. Highly recommended.